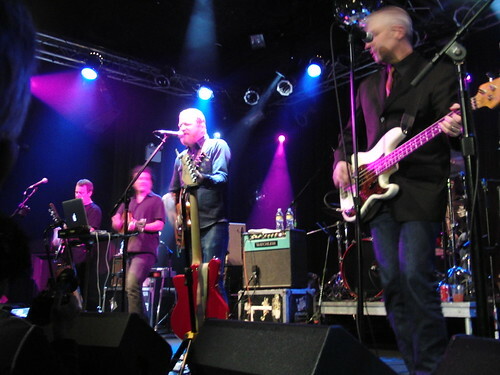 Almost exactly one year since their last trip to NYC, Camper Van Beethoven returned and performed an outstanding set at the Highline Ballroom on Friday night. As the first band to play on this night of the Cracker/Camper tour, the set was somewhat shorter, but at seventy-five minutes still packed in a full run through the twenty year catalog. The band was supplemented for this tour with sometime-member David Immergluck on pedal steel and mandolin and Immy’s presence added a dimension both to the sound and stage energy. This set was recorded from directly in front of the soundboard, as the Neumann microphones are supplemented with a feed from the soundboard. The sound quality is excellent. Enjoy! This Recording is now available for Download in FLAC and MP3 at Archive.org [HERE]. If you email nyctaper for access to this recording, we expect that you will PLEASE SUPPORT Camper Van Beethoven, visit their website, and purchase their official releases directly from the store at their website [HERE]. -ps- thank you for all that you do! Cracker is coming soon. Possibly as early as tomorrow night. sorry it should be Skinhead Stomp!